These custom (special order only) stainless valves are designed for the late model Dual spark plug engine enthusiast, who wants to install oversized performance valves in their high performance head. The problem with installing typical 11/32" valves in these heads is that the unique tooling necessary to perform this operation isn't available to most machine shops. The solution? 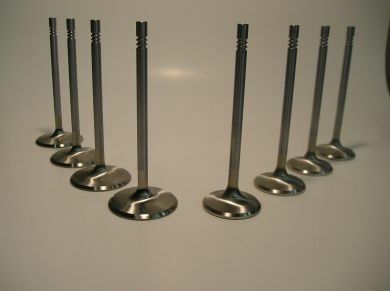 Our custom 7mm stem valves that require no additional machine work other than standard valve seat machining. Designed for standard multi-groove lock location, these lightweight stainless oversized valves feature the same high flow characteristics as our standard 2.3 valves. Please allow 3 weeks for them to be custom made as we no longer stock these, Thanks!